Today was a memorable day because I went on the most stunning bicycle ride I have ever been on. It was absolutely breathtaking every peddle of the way. The countryside of Aichi, Japan was filled with a sense of tranquility that I haven’t quite felt in other places in the world. 6 AM… Alarm. Stretch! Water! Banana! Water! 7 AM… Meet Toshiaki Yokoi: Owner of Bike Quest in Aichi, Japan. Mr. Yokoi picked me up from the hotel and brought me to his bike shop to build my Fairdale Goodship road bike. Once we arrived at Bike Quest, Mr. Yokoi hurried inside to waste no time. I was extremely curious to see how a bike shop in Japan would be organized. Two steps inside the store I was wowed as it was packed with so much inventory! Mr. Yokoi told me he had the same bike as mine in his store; an orange Goodship frame & fork. I was very happy to see there was a Goodship available for someone on the other side of the world. Our first stop was at a Circle K for sandwiches, pastries, and coffee. Mr. Yokoi spoke little English so we communicated through facial expressions and hand gestures. I knew nothing about the ride or where we were going, but that’s the best way to start a real adventure. After I built my Goodship Mr. Yokoi said there would be two of his other friends joining us. As he was trying to communicate that to me, Fumi Kondo came flying in. 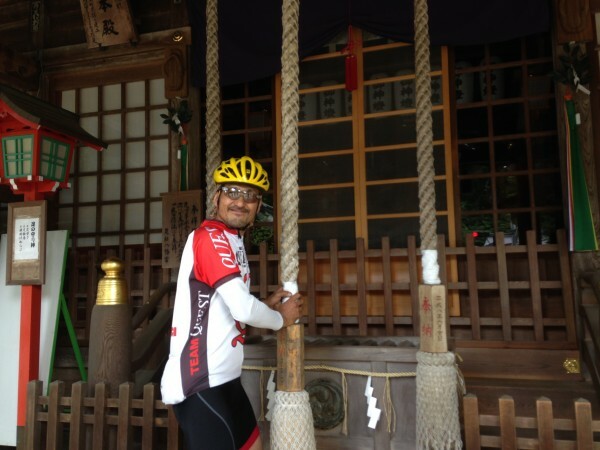 Fumi has been a customer of Mr. Yokoi’s bike shop for years. Recently, she purchased a road bike from Bike-Quest and this was only going to be her second ride. Fumi’s spirit and the confidence was obvious, she’s a fighter with a big heart. Fumi also spoke very little English but was willing to try to express herself to me anyway. Last, but not least Takeshi Hayashi rode in at 8 am on the dot. Takeshi spoke the most English and I immediately felt a big brother vibe from him. He was able to make the journey special by translating. Thanks to Takeshi we were all able to communicate. We rolled out at a fast pace. 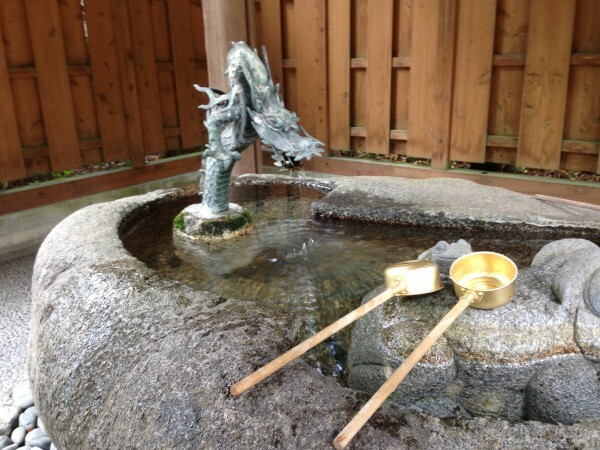 The Quest for Sanshu Yakishi Asuke begins! I felt the shivers down my spine and saw the excitement on everyone’s faces as we pushed up hill. 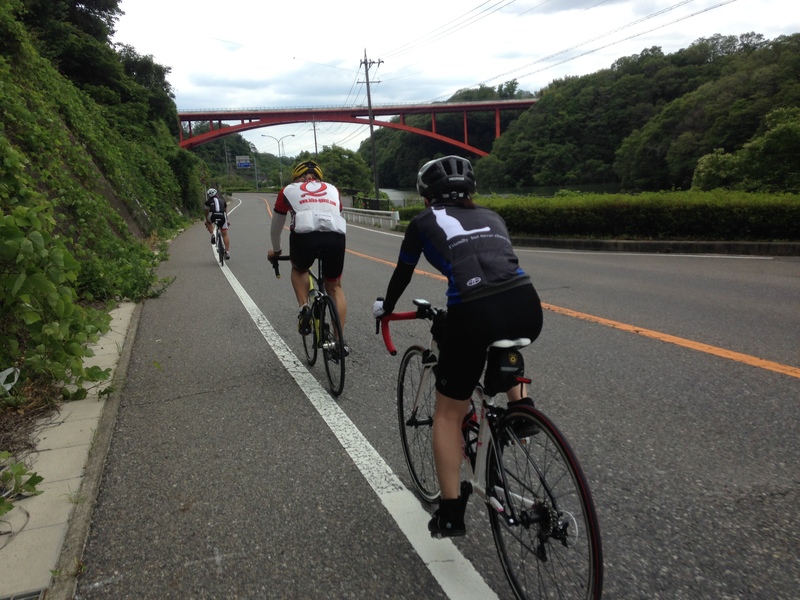 We rode for 25 miles before reaching Sanshu Asuke Yashiki which they told me means “Help Legs”. First, we stopped to pray at a temple and they taught me some of the traditions and etiquette of the Japanese people. We gave thanks to the Gods and off we went to the Village of the Artisans. The air was rich and the nature was green and full of life. 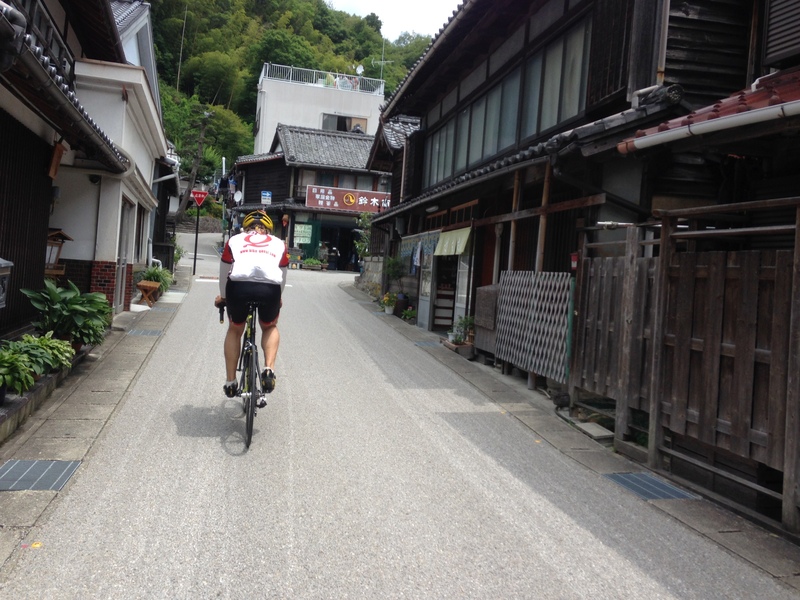 I noticed that people in Japan love their land and cherish every little grain of sand. It was very inspiring and emotional for me. I felt the connection we all had there and the bond we were growing in just a few hours. On the road to the Village of the Artisans. The Village of Artisans is hundreds of years old and unique in design. It was as if we time traveled back in history. Each artist’s craft was a tradition passed on to them from their ancestors. The woman pictured above made all of her crafts out of straw. Historically, straw was thought to be more valuable than trees because the products made from it were a necessity to life in Japan. This artisan made clothes like the one she is wearing by weaving thread side to side. In the past it was said that a woman would not be ready to be a wife until she could weave. Another artisan made umbrellas out of bamboo. I was told that the secret to a long life for the umbrellas is to thoroughly dry them after use. The colors deepen as you use it. Indigo dye is made the traditional way, without using any chemicals. It has an antiseptic effect and serves as a insect repellent. It is also gentle to people with atopic dermatitis. This artisan dyed clothing and rice paper with the indigo dye. She wanted me to experience the process of peeling the rice paper off from a silk screen. This artisan is called “Mr. Smith”, the blacksmith. It was super awesome to witness the craftsmanship and skills this man has. Above, the artisan is weaving baskets out of bamboo. Asuke is famous for the abundance of bamboo tress that are high quality. This artisan specialized in wood turning. 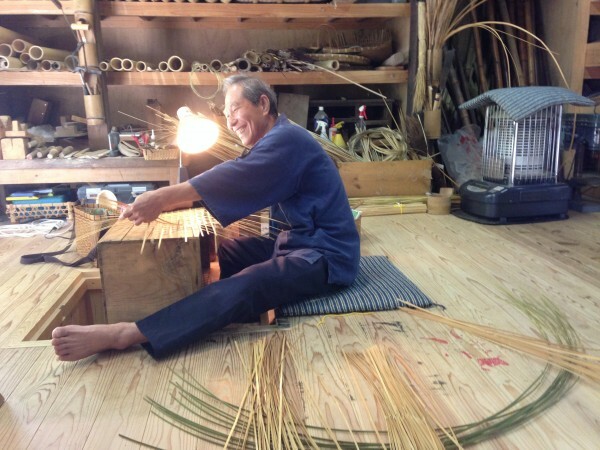 Kiji-shi wood turners create trays and bowls from Keyaki and Tochi using a turning wheel. It’s incredible how perfect and intricate these pieces are. Mr. Yokoi served us Hinoki-Chaya, famous rice cakes covered with a delicious sweet sauce. I drool thinking about it! Sweet potato glazed with sugar anyone? That’s the yellow dessert you see us holding is this photo. It is Mr. Yokoi’s favorite and now mine too! Mr. Yokoi reminded me of my father who has passed away. His generosity, personality, companionship, and love is vibrant. In less than two hours I felt like I had known him for years. I’m sure our souls have met in a past life. I will keep this day in my memories until I’m old and gray. Mr. Yokoi, Fumi, and Takeshi are now life long friends of mine. I am forever grateful to them and Fairdale for such a powerful day.